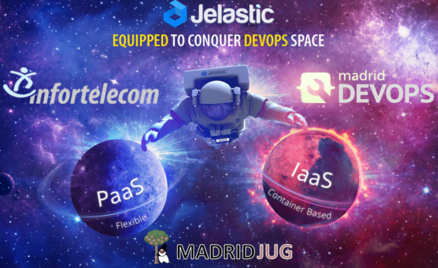 DevOps, Java, Docker Containers, Jelastic Cloud and Spain. What Brings Them Together? Here you can get acquainted with the presentation shown by Ruslan. With Jelastic DevOps PaaS developers can value all the benefits of Docker containers in the cloud. And Infortelecom is one of the first hosting partners that provides its customers with Jelastic 4.0 version with the advanced level of production-ready Docker hosting. We are convinced that our containerized cloud platform in combination with the experienced support level and cloud managed hosting from Infortelecom will definitely satisfy DevOps teams in Spain and abroad. And the first feedback we’ll be glad to get from Spanish DevOps and Java communities. That’s why Infortelecom provided some free resources on the platform for the attendees of our Madrid event – looking forward to your impressions!